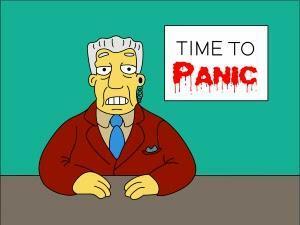 Forget "keep calm and carry on" - the message from The Bank of England is simple - Panic! Bank of England governor Mark Carney said yesterday that a no-deal Brexit could send the pound plunging and trigger a worse recession than the financial crisis as it seems Project Fear is well and truly back in play as Theresa May approaches the vinegar strokes of this Brexit debacle. As The BBC reports, Carney said the UK economy could shrink by 8% in the immediate aftermath if there was no transition period, while house prices could fall by almost a third. The Bank of England also warned the pound could fall by a quarter. The Bank's analysis comes after the Treasury said the UK would be worse offunder any form of Brexit. 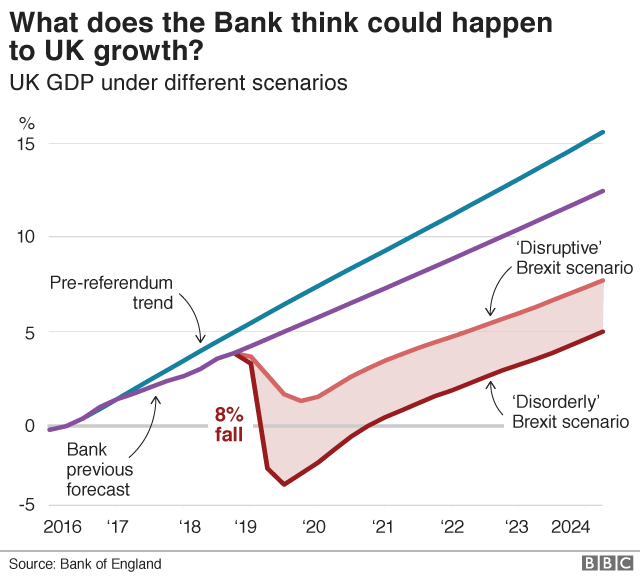 This Bank's scenario is not what it expects to happen, but represents a worst-case scenario, based on a so called "disorderly Brexit". The scenario looks at the five-year period after the UK leaves the EU. But by the end of 2023, the economy is expected to resume growing. Scared? You should be! Remember this is from the smartest men in the room that told you stocks would crash and the economy collapse if you merely voted for Brexit in 2016. But, at least one former central banker has come clean this week to admit that The Bank of England's fearmongering is utter garbage. As FT Adviser reports, Andrew Sentance, a former Bank of England official and government adviser, dismissed the BoE's forecasts as "bogus" and politically motivated. "The reputation of economic forecasts has taken a bad blow today with both UK government and Bank of England appearing to use forecasts to support political objectives. Let's debate Brexit - which I strongly oppose - rationally without recourse to bogus forecasts." "The analysis is highly speculative and extreme. It will add to the view that the Bank is getting unnecessarily involved in politics and that will further undermine perceptions of its independence and credibility." Mr Sentance served on the Monetary Policy Committee (MPC) of the Bank of England, the body that sets interest rates, from 2006 to 2011, and was an adviser to UK government in the 1990s and 2000s. While BoE unleashed its panic forecasts, the bank also carried out "stress tests" on UK banks. This involves assessing whether the banks would withstand a range of economic outcomes, including the hard Brexit scenario outlined above. The Bank of England concluded that all UK banks would be able to survive such an outcome without requiring a bailout. So all the worst parts of the bible will hit the British economy if a no-deal Brexit occurs... but don't pull your deposits from UK banks because they're fine - trusts us! ?